We are excited to announce that Artz Music & Photography has won the 2017 Couples’ Choice Award from WeddingWire.com for the eighth year in a row, once again ranking Sue and Matt Artz as being among the top 5% of wedding professionals nationwide! This is the eighth consecutive year that Artz Music & Photography has received the Couples’ Choice (formerly Bride’s Choice) Award from WeddingWire, and we thank all of our brides and grooms for helping us achieve this huge honor again this year. Winning the WeddingWire Couple’s Choice 2017 Award ranks Artz Music & Photography among the top five percent of wedding professionals nationwide for the eighth time, after also earning a NEW WeddingWire “Rated” Badge Award for more than 135 reviews. ARTZ MUSIC & PHOTOGRAPHY previously received the BEST OF WEDDINGS Award from The Knot in 2010, 2011, 2012, 2013, and 2014; as well as the COUPLES’ CHOICE (formerly BRIDE’S CHOICE) Award from WeddingWire.com in 2010, 2011, 2012, 2013, 2014, 2015, and 2016, in addition to the Most Popular DJ Award from Thumbtack in 2012. Based in Kill Devil Hills, North Carolina, the husband-wife team of Artz Music & Photography provides wedding ceremony music and reception DJ services by Sue Artz and photography by Matt Artz, including Outer Banks (OBX) beach weddings, family portraits, senior pictures, engagement photos, bridal portraits, and “trash-the-dress” day-after sessions. Sue and Matt Artz are also the owners and editors of the local entertainment news source OBX Entertainment, and the North Carolina film industry news source NCfilmNews.com, and they are the founders of the Outer Banks Halloween Parade and the Halloween International Film Festival. 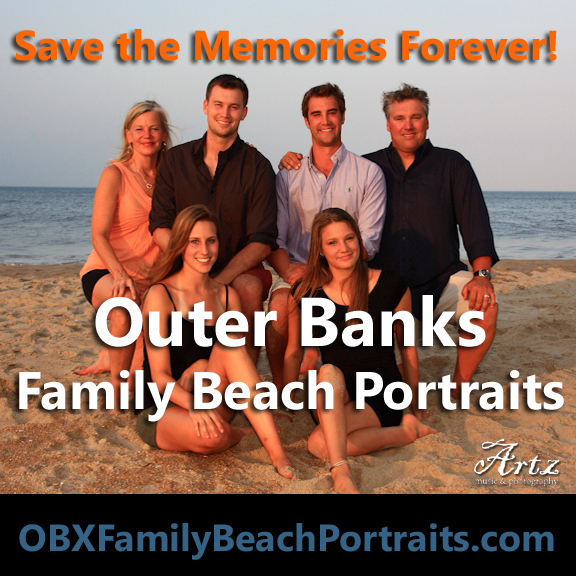 The couple has lived and worked on the Outer Banks since 2000, and they currently reside in Kill Devil Hills, NC with their son, Ozzie. This entry was posted in Affordable Outer Banks Weddings, Reviews and tagged Artz Music & Photography, Bride's Choice Award, WeddingWire. Bookmark the permalink. ← Artz Music & Photography Wins WeddingWire 2016 Couples’ Choice Award for 7th Year!